Calling all Balayage or Ombre hair owners! If you’ve heard about Purple or Silver shampoo to help brighten up your Balayage but have no idea it is or which one to buy – then this article is for you! I’ve had Ombre and Balayage hair for years now and I’ve tried a LOT of different shampoos to help keep them looking great. So I thought it was about time to share with you my ultimate guide to purple shampoo! Editor’s Note: There’s an even newer trend on the market now…Sombre – Read all about it here! 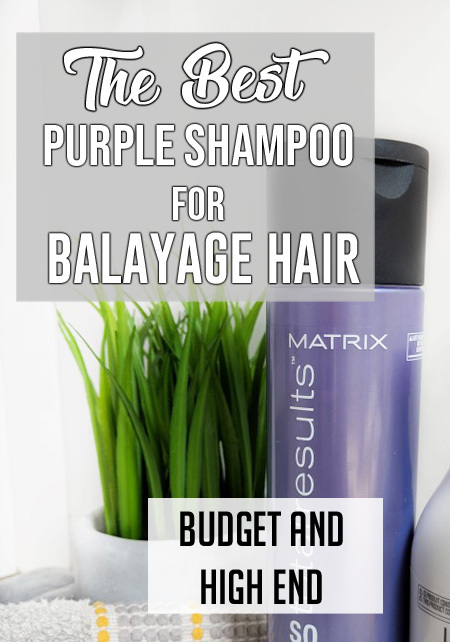 Here are my favourite purple and silver shampoos for Balayage or Ombre hair – both budget and high end! What Is Purple Shampoo and What Does It Do? Purple shampoo is a brightener for dull, brassy or overly yellow hair. Blonde hair or hair with balayage or ombre can sometimes become very yellow and warm especially if you’ve been in the sun or it’s been a while since you had a toner put on. Purple (sometimes also called silver) shampoo helps to neutralize those brassy tones and bring back a more white/blonde tone to your hair. This is perfect if you’re a blonde all over or if you have balayaged or ombre ends – it just helps to refresh everything, at home for a fraction of the price of a toner at the salon! Don’t be fooled, they’re both actually the same! Purple is the colour of the shampoo that gives a more silvery tone to your blonde so they’re sometimes referred to as either. You use purple shampoo just like any other shampoo, usually leaving it on for a few minutes before you wash it off. Some treatments say to leave on for a little longer, say 5-7 minutes, others wash out right away. You can use a purple shampoo 1-2 times a week depending on how cool toned you like your blonde to be, and some people even put it onto damp hair and leave it up to 30 minutes for a super ice blonde look. Be careful with this one however, if you get a good purple shampoo and leave it on for too long you could turn your hair blue! Start with the recommended time on the bottle and go from there. READ: Best Shampoo & Conditioner Combo for Balayage Hair…One for the Blonde half, one for the Brunette! 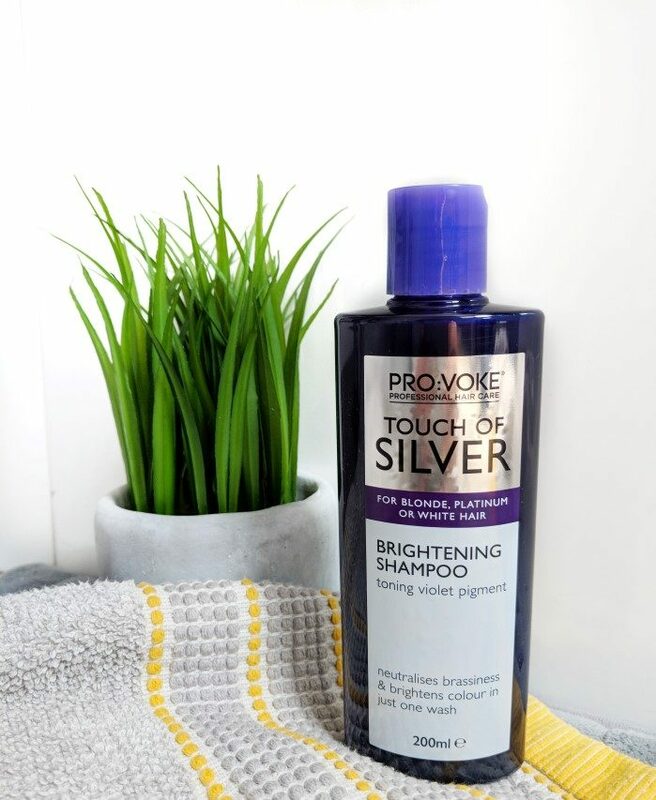 Pro:Voke Touch of Silver Brightening Shampoo (£4) – Let’s start with the cheapest of the bunch, Pro:Voke Purple Shampoo. You can find this one online or in your local supermarket and it’s purse friendly but actually works really well! You can buy a conditioner from the same range but I find on it’s own with my normal conditioner it’s great. You do tend to go through the bottle quite quickly however with it being pretty small, so factor that in when deciding, but for a first time purple shampoo trial this is a good one to start with. 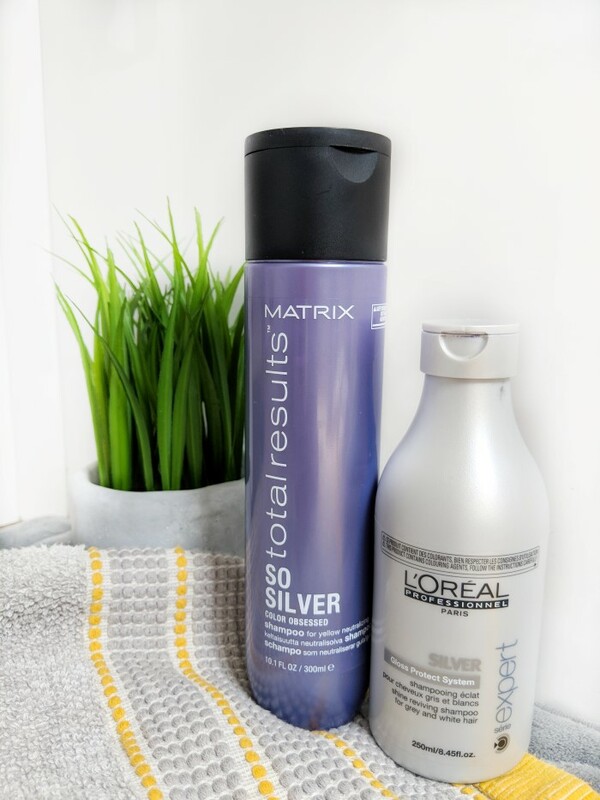 Matrix Total Results So Silver (£8) – Next up are our mid-range shampoos including this bottle from the Matrix Total Results range. Double the price of the Pro:Voke bottle for 100ml more, but it does have a thicker more luxurious feel. I tend to use less of this product each time which means it goes a long way. Great results and easy to wash out. L’Oreal Expert Silver Shampoo (£10) – This was one of the first higher end silver shampoos I splashed out on and it does work very very well. I’ve also had this bottle for over a year as I find I only need to use it once every other week. It smells great, It washes well and it does exactly what it says on the tin. 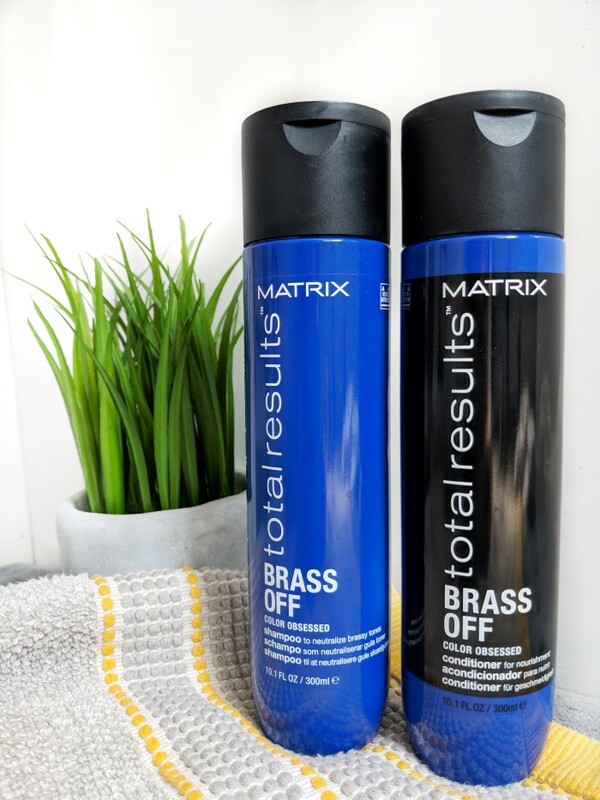 Matrix Bras Off Shampoo & Conditioner (£16 for set) – Now we’re onto the serious stuff, the Matrix Brass Off range. These are hands down the best purple shampoo’s I have ever used and I can’t recommend them enough. Both the shampoo and conditioner with this one makes a big difference to your hair and used together they’re an absolute dream team. 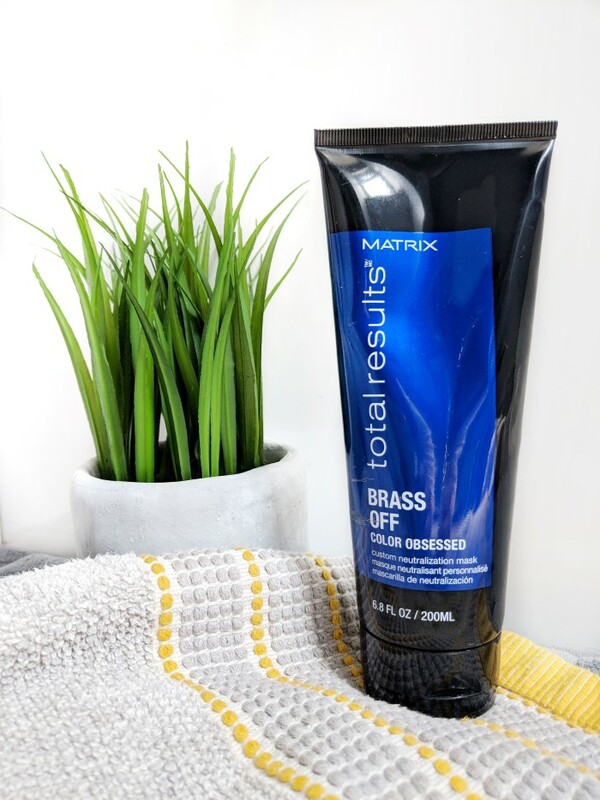 Matrix Brass Off Treatment Mask (£10)– Last but not least, THE BIG DADDY of purple shampoos, the Matrix Brass Off Neutralisation Mask. Leave this thick hair treatment on your hair for 7 minutes and you’ll get the best results out of all. So much so I only tend to use this bottle once a month and it’s one wash miracle for brassy hair. Just a word of warning, wear gloves with this one unless you want blue hands and nails at the end of your shower! IT’S INCREDIBLE, the ULTIMATE purple shampoo.